When change requires you to challenge people's familiar reality, it can be difficult, dangerous work. Whatever the context--whether in the private or the public sector--many will feel threatened as you push though major changes. But as a leader, you need to find a way to make it work. Ron Heifetz first defined this problem with his distinctive theory of adaptive leadership in Leadership Without Easy Answers. In a second book, Leadership on the Line, Heifetz and coauthor Marty Linsky highlighted the individual and organizational dangers of leading through deep change in business, politics, and community life. Now, Heifetz, Linsky, and coauthor Alexander Grashow are taking the next step: The Practice of Adaptive Leadership is a hands-on, practical guide containing stories, tools, diagrams, cases, and worksheets to help you develop your skills as an adaptive leader, able to take people outside their comfort zones and assess and address the toughest challenges. 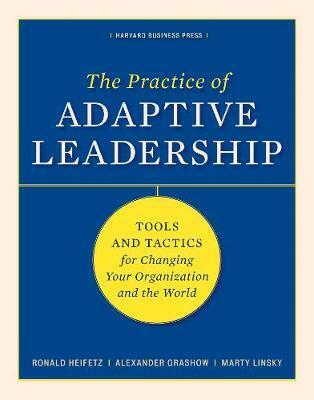 The authors have decades of experience helping people and organizations create cultures of adaptive leadership. In today's rapidly changing world, The Practice of Adaptive Leadership can be your handbook to meeting the demands of leadership in the midst of complexity.